September 26, 2016 (Tokyo, Japan) - Japan Display Inc. (JDI) today announced the development and production-readiness of a 12.3-inch curved liquid crystal display for automotive applications. The TFT LCD module, based on low temperature poly-silicon (LTPS) technology, enables a simplified module structure by integrating the driving circuits into the glass substrate and by minimizing the number of driver ICs, as compared to conventional amorphous silicon (a-Si) technology. The module is curved (concave), with a radius of 1,500mm. Whether it’s daytime or nighttime, due to its high brightness, high contrast and wide viewing angle, it assures excellent visibility. JDI's proprietary processes and facilities to produce this curved display are ready for mass production, with samples available in Q1 2017. JDI can develop other curved and/or shaped*1 TFT LCD custom-variants of this display, or develop variants as Pixel EyesTM modules which incorporate JDI's proprietary integrated touch functionality. Recently, LCDs have been widely adopted in automotive vehicles, for navigation, instrument cluster panels, rear-view monitoring, rear seat entertainment, and in mirrors (rear- and side-view). However, most displays are flat, and the increasing number and size of the displays inside the vehicles is creating new challenges for vehicle interior designers. 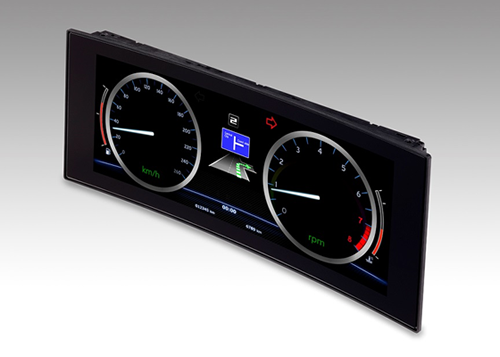 Curved TFT LCD modules, which conform to the interior design, are one of the solutions in response to these challenges. JDI's TFT LCD module not only provides a curved, concave surface, but also satisfies the requirements of automotive applications. LTPS technology, which has a higher aperture ratio as compared to conventional a-Si technology, realizes high brightness*2 and low power consumption. IPS-NEOTM also contributes to high-contrast imagery*3 with dark black colors, resulting in beautiful images from any viewing angle. JDI will continue to develop displays which contribute to the livability for the　vehicle interior, with a view towards the future of autonomous driving. *1 Shaped-displays may include corner cuts, rounded corners, etc. Japan Display Inc. (JDI) is a leading global manufacturer of advanced small- and medium-sized LTPS LCD panels. By leveraging its advanced technologies and the world's largest LTPS production capacity, JDI provides high resolution, low power consumption and thin displays for smartphones, tablets, automotive electronics, digital cameras, medical equipment and other electronic devices. JDI, which commenced operations in April 2012, was formed through the consolidation of the display panel businesses of Sony, Hitachi and Toshiba. The company's common stock is traded on the Tokyo Stock Exchange with the securities code number 6740. . For more information please visit: https://www.j-display.com/english/.